Most song memories are happy ones ("Sugar Shack” always reminds me of swimming at our neighborhood pool.) Others are not so pleasant, like "He Ain't Heavy, He's My Brother”, which brings to mind a photo posted on the wall in my high school Sociology class of a Viet Nam soldier carrying a wounded comrade to safety. But of all the song associations tucked away in my brain just waiting to spring to life at the sound of a few familiar notes, none will ever spark such pure, blubbery emotion as "Silent Night”. This is the very first year I can say that. Up until now, as beautiful as the song is and as much as I've always loved it, hearing it piped into every department store, grocery aisle, elevator and on-hold phone call, sadly renders me "tune deaf” to it before Christmas even gets here. That will never be the case for me again. 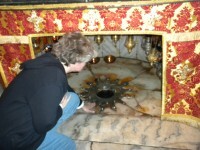 You see, back in February my husband and I traveled to Israel, and about midway through our trip we journeyed to Bethlehem to the Church of the Nativity. Now normally, as those of you who are fortunate enough to have visited this holy site will attest, the place is teeming with fellow pilgrims, each one eager to walk down the narrow steps into the lower cave – the believed location of Jesus' actual birth. So crowded is the small cramped space that they typically keep the body traffic moving along at a brisk pace, so as to allow more folks a chance to see it. However, on this occasion we got lucky in that for some reason they held our group down there for an unusually long time. So what did we do? Well, first we each gently placed our hands on the ornately decorated plaque that marks the spot – overwhelmed by the magnitude of the moment. Then we stood there in darkness illuminated only by a few candles, on the very place where "The Word was made flesh and dwelt among us” and with voices softly choked with sobs and overwhelmed with passion, and even in more than one language, we spontaneously began to sing "Silent Night.” When it was over, no one said a word for several minutes. No one could. It was truly… silent…and holy. Of course time and reality have a way of returning everything to normal, and before I knew it I was back at home doing laundry and accidentally breaking the yolks on Marc's fried eggs. For a while the memories of our trip were vivid, and I'll admit I shared too many photos with too many captive audiences. But as the weeks and months went by, I gave less and less thought to the whole experience. That is until this fall, when the little singing group I'm in began to review the repertoire for our upcoming holiday performances. As we ran through the sheet music for "Deck the Halls” and "Let it Snow” and "Carol of the Bells” I was totally focused on my quarter rests, and hitting those blasted G-sharps (a real challenge for this poor little alto!) Then we got to "Silent Night.” One measure into it I remembered where I was the last time I sang it, and I was a total mess. It's a wonder I got through the rest of that rehearsal at all. Search for Holidays articles similar to "Silent Night, From a New Perspective. Search all articles similar to "Silent Night, From a New Perspective".